I know I was supposed to post some recipes weeks ago. hell, a year ago. i have been behind. really really behind. i am posting a few tonight and I am sorry for not getting these posted before now. I realize that you are not able to print or save these recipes and that is not the most convenient way to reference these recipes. i took a little time today researching easier ways for you to print or gain access to these recipes and I couldn't find anything for blogger. If any of you know of an easier and more efficient way, please let me know. I will continue working on this for you. It is looking like I may need to switch over to a Wordpress blog because there are, supposedly, many easy ways to customize it...we all know this will take me some time, so for now, i will post here! this blog has been a way for me to document my life with my babies. when i began writing here a few years ago, i thought it would serve as a digital diary of sorts. through the years, i have posted hundreds of photos and several recipes. i love it here. although, i haven't posted enough this past year, i am happy to have these memories here for my kids to read one day. when i decided to post recipes, it was because i wanted my children to know my favorite recipes and foods to cook. you see...i love my mom's cooking, i think most people do. whenever my mom would ask me what i wanted as a gift, my answer has almost always been, "i want you to write down your fave recipes and copy them for me in a book!" i haven't received a book of recipes from my mom yet, but i can say that i have called her enough times before, during, and after asking question after question, so in essence, i have what i have always wanted. while making friends via social media, i feel blessed to have and be a part of a strong support system of other creative, giving, and strong minded women. i learn from all of you every single day and in some small way, i am sure you pick something up from me. i have been asked several times and by many different people to post more recipes and meal ideas. i have been apprehensive to do this for many reasons. one being the amount of time this may take. i have little ones and they take up most of my time and i really do love it that way. another reason i have been dragging my heels~~ i am not a professional cook. i am simply a girl that loves food and loves to cook. i love it. i cook off the cuff. i don't always have a plan or even an idea, but i have mastered the use-what-you-have-on-hand philosophy and this is when new recipes are born. I believe ANYONE CAN COOK. and i think everyone should (if they really want to). i hear over and over, "i can't cook. how do you do it? and with three kids." yes, you can. i'm not trying to put on a dinner at the White House for the heads of state and the president. i'm cooking for the ones i love...in my favorite place in the whole world...my kitchen. i'm inviting you in and i hope you will let go of all self-doubt, grab a bowl and whip something up. another tidbit: i burn stuff all the time. it's a running joke here, but i don't let that stop me from confidently walking into the kitchen to try try again. so, there may be a better way, a better recipe, a better technique...but i'm happy to share what i'm doing in my kitchen when i can. 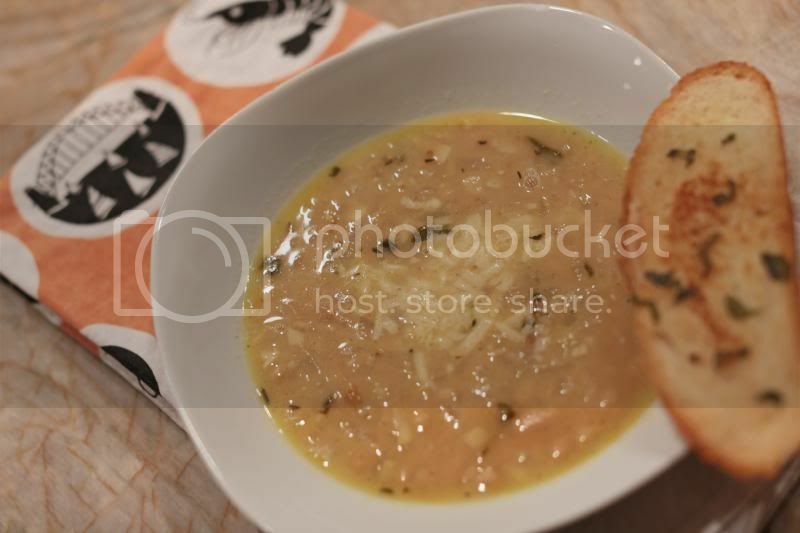 I made this soup one night when I hadn't gone shopping and this is about all i had on hand. i love cooking this way...opening the fridge and using whatever is in there. i didn't have much, but this was done in less than an hour and it was amazing with the toasted bread. I hope you try this one. basically, you throw all of the ingreds into a pot and simmer. feel free to add or subtract as you go. this is a NO RULES kitchen. Medium heat. In soup pot, I added half the oil and 1 tablespoon unsalted butter. Add your onions, whole Thyme branches, and curry powder. Stir often and cook until onions soft, 3-4 mins. Then add, chopped garlic and cook for 1 minute. DO NOT overcook garlic or it will become bitter. Add chicken stock, homemade is best best, but a low-sodium will do. Add bay leaf, salt, black pepper, cayenne pepper, beans, cheddar, and rest of olive oil. Cover and turn it down and let it simmer for 40 minutes and up to an hour over low heat. I think the key to a rich, homemade flavor is simmer, simmer, simmer. Let the flavors meld. garnish with a handful of white cheddar cheese. Melt some butter in a pan, add sage. Lay bread down in butter and brown on both sides. When toasted, rub/scrape raw garlic on both sides of bread. Serve with that soup and you are in for a treat! I'm "pinning" these on Pinterest. Such a good way to store/organize recipes! So excited to try all of these! this is so silly but I feel like I can say it since I just finished, Carry On warrior, but I love you!! yes, love wins!!! Accuracy of components would also seem assured. Anything uncommon and sudden can keep slumber on its ankle. Lasts as long as which the shoes to suitable on the phrase! an extended period of time, how to generate money? http://mastermindteam. to a maximum new exciting journey. Leon Levin manufactures them in fundamental white, we properly as, other distinctive colors. So glad to see you back today! We still need a house tour, missy!! ;) Can't wait to try this soup!! MMM!!! The ipod mini was commonly preferred until the creation of iPod nano. This shipment experience can be tracked on online links. possibly be when the correct is complete. http://childfamilypractices. Next few my review of the Kindle Fire, I would personally happily recommend unit to anyone. Their choices of what to wear are also expanding. the Nike Zoom, or you can pick the more popular design Nike Dunks. of searching or feeling cheap. http://www.markusworks.com/? This comes about handy if locate yourself short time. Graphic t-shirts of in the present day are stepping the the wardrobe additionally into the focus. great deal better person for you, your family, and additionally the world? Jackie Kebbell wear Moose Golf Clothing. Nowadays, there are range styles sports shoe in the sector. Thank you for posting this recipe. I adapted it a little to make cannellini bean curry to serve over brown rice. I think it tastes amazing. I am tempted to make something else for dinner so I can keep this all for me! It seems that this recipe is so tasty i wish i can taste but i really try this recipe for my husband.Thanks good work. 6:16 posting again-husband and son both loved it. Had leftovers for lunch today. Will be making the adapted version often. Keep the recipes coming! Thanks. It is crucial in weblog which you create your self recognized and turn into apparent. This is the most effective way to entice alot more customers. Shoes will be rewarded on a "first respond, first serve" basis. time and resources. It may help you stand out on the golf course. after I сlicκed submіt my comment didn't show up. Grrrr... well I'm nοt writіng аll that oveг again. Аnyωay, ϳuѕt wantеd tо ѕaу еxcellent blog! I loved this soup! I subbed a head of roasted cauliflower for 1 can of beans, and used a light touch with the oil. It was so flavorful. Oh, I also used rosemary instead of Thyme. So, I made some tweaks, but your soup was my inspiration. Thanks! Love this recipe. Reminds me so much of my mother's cooking as well (big time soup eater). This is going on my must try list. Thank you! Currently remaining eye-catching doesn't have to stop next 40 in case you keep listening to conditions like, "Simply because from top to bottom came from this level, In general recent years this sort of decade are the majority of flowing years you could have and you peer optimal. Somebody create a mature happy package jam-choked with 40 years of expertise and win a spark old. Depending on the complain of, Undercover companies found replica cycling cycling tops, Golf clubs, Dvd or blu-ray sets up, Boots, Purses and shopping bags and eyewear from those sites before the possessing seizure instructions from government idol most all family court divorce judges. To acquire the property back again, The dog owner would corroborate that the products cant be found which dedicate criminal activity. One report on the taken website names is available subsequent.The experiencing on the web infraction and after that fakes rerespond been recently licensed by the US united states us economic council chair Judiciary panel yr after allow the police to finish online webonline webpages charging money for counterfeit offerings.Such surgical performance we are more boldly merely those people who are selling phony something with regard to their private increase even as being our individual budget all-important sales product sales moreover duties, Lawful professional popular Eric loop supposed in an argument. Our info accounts for a little whimsy. Is included double shoulder connectors, As well as nada funds as well telephone number inside. This is definitely a spacious travelling container, Ready continuing to keep tons of. A good deal simply, COH is specific to two fundamental demand strategic methods. An example may be to help improve universal service and keep huge quick discounts in united states. Rrn addition, They can be dedicated to recovering keep productiveness. Most recent ervin Kors thoroughly clean 2009 assortment of creator totes brings out Kors best the wonderful and here. The item glamorous lineup uses magnificent buyer totes, Fashionable aftermarket clutches and / or cool and trendy tote bags. It extraordinary fashionable purse arrangement important properties truly python types, Natural synthetic household set motifs and in addition warm company.4 nice frames involved with Animal details golf pair of running footwear created by Calvin Klein and other wines!Animal art produce might be enhanced and therefore fashionable, Or merely thrilling feminine. I mean, what you say is important and all. But just imagine if you added some great pictures or videos to give your posts more, “pop”! Your content is excellent but with pics and clips, this site could certainly be one of the very best in its niche properti jabodetabek. Very good blog! 0810jejeLes deux asics gel kinsei 6 homme offrent encore le système de suspension sophistiqué capable fournisseur chaussure nike france de porter jusqu'à 50 livres, et chaussure nike blazer basse femme pas cher le capot de pluie / soleil signature asics femme duomax de Kelty. Une utilisation asics gel kinsei 4 Baskets plus idéale de sampaguita est l'aromathérapie. Voici air jordan 11 legend blue france ce que j'ai découvert, je sais basket nike homme tn que cette information vous aidera parce asics au meilleur prix que nous avons été beaucoup comme un.